CrazyKinux's Musing: EON Issue #011 on its way right now! 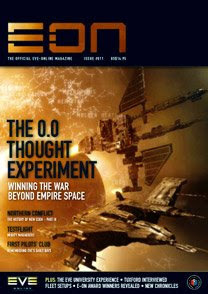 The latest issue of yours truly's favourite EVE Online magazine is on it's way, having shipped out on the late last week. Here's what's coming up in this next issue, though I will have a detailed ToC (table of content) of the issue when it gets here, as usual! ONE ALLIANCE TO RULE THEM ALL? - Why are Julius Caesar, JRR Tolkien and Isaac Asimov meeting in a smoky station bar in the Drone Regions? And why does CCP's Greyscale appear to be preening his mechanical feathers? Why, they have come together to plot the conquest of 0.0, of course! In order to ponder the ultimate military conundrum of EVE, Terra Nova's Nate Combs has assembled (in his own head, we might add) a stellar cast of some of the greatest thinkers in history and had them play out a bizarre thought experiment to consider the motivations and make-up required of an alliance in order that it might rule all others. Don't worry, Greyscale's wings are purely cosmetic. MARAUDERS - Last issue we brought you a Testflight on the best budget cruisers to take into PvP. This time we try out what are among the most expensive (and apparently the most versatile) sub-capital ships on the market: the much-talked about Marauder Battleships. How should they be used on the post-Trinity battlefield, if at all, and what mods should you fit? Answers inside. BACK IN THE DAY - With each successive patch and expansion EVE has been evolving to the point where the original game from 2003 is almost unrecognizable. Speaking to a bunch of crusty EVE veterans we catch a glimpse of what EVE was like then, what it's like for them now and ask whether the changes made have been for good or for ill.
HISTORY OF NEW EDEN - PART III - The Great Northern War saw the winding down of pirate corp mOo and the wind up of Band of Brothers, in-between which we saw the rise and fall (and rise again) of many alliances across EVE. Most importantly New Eden's first big bust-up formed the blueprint for every major war that has followed. EVE-History.net's Reiisha looks at how it started and chronicles the slow grind of it's eventual end.